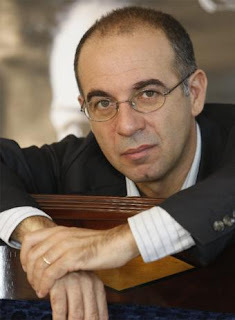 The screenwriter and director Giuseppe Tornatore, the creator of the Oscar-winning classic movie Cinema Paradiso, was born on this day in 1956 in Bagheria, a small town a few kilometres along the coast from the Sicilian capital Palermo. 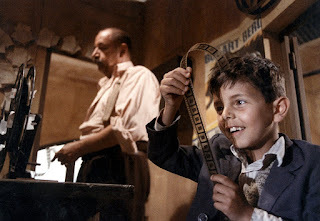 Known as Nuovo Cinema Paradiso in Italy, Tornatore’s best-known work won the award for Best Foreign Language Film at the 62nd Academy Awards following its release in 1988. The movie, written by Tornatore, tells the story of Salvatore, a successful film director based in Rome who returns to his native Sicily after hearing of the death of the man who kindled his love of the cinema, the projectionist at the picture house in his local village, who became a father figure to him after his own father was killed on wartime national service. Much of the film consists of flashbacks to Salvatore’s life as a child in the immediate post-war years and there is a memorable performance by Salvatore Cascio as the director’s six-year-old self, when he was known as Toto, as he develops an unlikely yet enduring friendship with Alfredo, the projectionist, played by the French actor Philippe Noiret. The movie is accompanied by a wonderful soundtrack by the composer Ennio Morricone, whose haunting theme captures the beautiful poignancy of the movie. Morricone worked with Tornatore on many of his films, including two other magically crafted works in Baarìa, set in his home town of Bagheria, and Malèna, which has the model and actress Monica Bellucci in the title role, another Sicilian story of a 12-year-old boy’s obsessive love for a beautiful young woman. Tornatore initially worked as a photographer, seeing his efforts published in various photographic magazines. By the age of 16, he staged had staged two plays, by Luigi Pirandello and Eduardo De Filippo, and then began making documentary films for TV, beginning a long association with Rai in his early 20s. In 1986 he made his debut in feature films with Il camorrista, starring the American actor Ben Gazzara, taken from a book by Giuseppe Marrazzo about a petty criminal in Naples, Raffaele Cutolo, who uses a spell in the Poggioreale prison to form the mafia organisation Nuova Camorra Organizzata, which would go on to become one of the most powerful criminal groups in Italy. The movie earned him a Silver Ribbon as best new director from the Italian National Syndicate of Film Journalists. Cinema Paradiso was only his second film, confirming the arrival of a new talent to rival some of the greats of the post-War era of Italian cinema, although the movie was almost written off as a flop. When it was released in Italy in 1988, it did little to excite Italian audiences and takings were poor. Yet the manager of a small cinema in Sicily, who had warmed to its theme, kept it on, inviting cinema-goers to watch it for nothing and then pay at the end if they liked it. The offer was taken up in increasing numbers and gradually the film acquired almost a cult following. It won the Grand Jury Special Prize at the 1989 Cannes Film Festival, which gave it the springboard that would eventually lead to the Oscars the following year. Tornatore’s body of work is not huge, amounting to only a dozen feature films in more than 30 years. The love of his native Sicily is a recurring theme and inevitably his movies are beautifully crafted. In addition to the Oscar and Golden Globe for Cinema Paradiso, Tornatore has won four Best Director awards at the David di Donatellos - the premier awards ceremony in Italy - for L’uomo delle stelle (The Star Maker, 1986), La leggenda del pianista sull'oceano (The Legend of 1900, 1998), La sconoscuita (The Unknown Woman, 2006) and his English language film The Best Offer (2013). 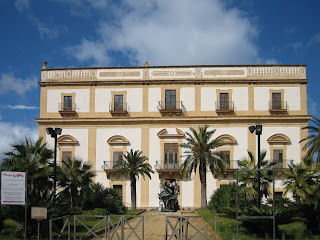 Baroque villas. It now houses a museum. Just 15km from Palermo in a southeast direction along the coast, Bagheria, which occupies an elevated position a short distance from the sea, has an atmosphere of a traditional Sicilian town and as well as featuring both in Cinema Paradiso and Baarìa - which is its Sicilian dialect name - it was also used for some scenes in The Godfather Part III. 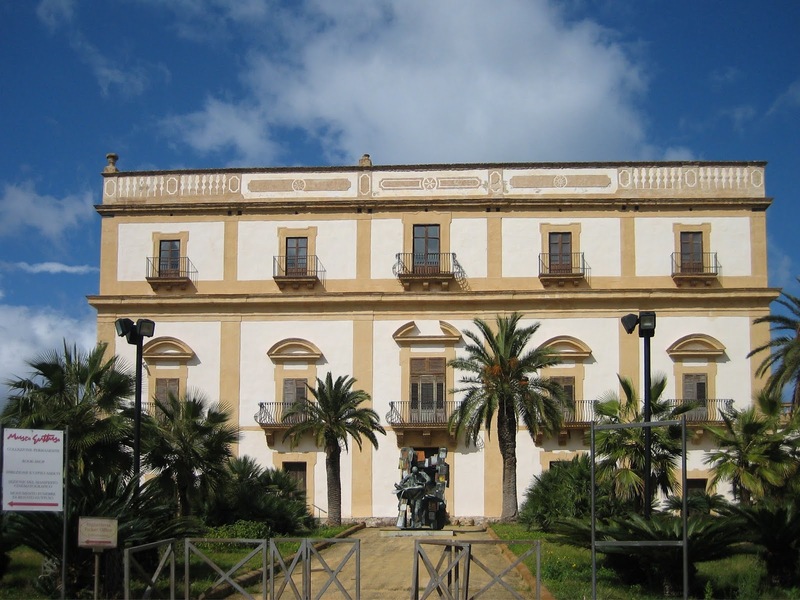 In the 17th and 18th centuries, it was a favoured by the aristocracy of Palermo as somewhere to spend the summer, the legacy of which is some 20 or more Baroque villas that add to the town’s charm. Very much mimicking the Oscars, the David di Donatello awards were conceived in 1955 as a way to recognise the best of Italian cinema and promote the movie industry. Like the Oscars, the award itself is a gold-plated statuette, in this case a replica of the statue of David sculpted by Donatello, probably in around 1430-40, and currently housed in the Bargello museum in Florence. 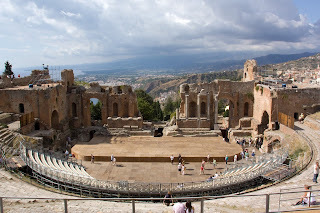 Between 1957 and 1980, the awards were presented at the open air Greek Teatre in Taormina.